The Dental Assisting National Board, Inc. (DANB) offers the Certified Dental Assistant (CDA) Examination for national certification purposes. In pursuit of CDA certification, candidates must successfully complete three tests – GC, RHS and ICE – in 5 years. The tests are acknowledged and/or mandatory in 37 states. Infection Control (ICE) Examination is one of the three tests included in the CDA Exam as a whole. Candidates must meet specific eligibility requirements before taking this assessment. Candidates can choose to take a computer-based or paper and pencil version of the test. The raw score, or the number answered correctly, will be converted to a scaled score in the 100-900 range. The minimum passing scaled score is 400. If unsuccessful in the attempt, a candidate may apply to take it again, but check with the local jurisdiction to find out if additional educational requirements have to be met first. 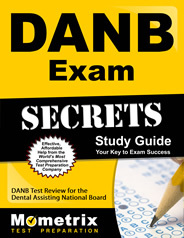 Ace the DANB test using our DANB exam study guide with practice questions. 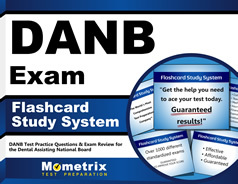 Quickly Solve Difficult DANB Test Questions with the DANB Flashcard Study System.